How can electrical energy from solar power be profitable? Types of solar thermal technologies. 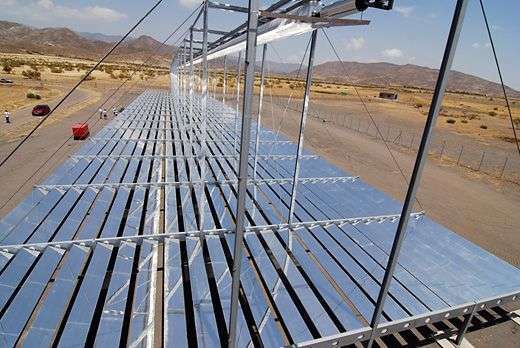 A team of researchers from the Universidad Politécnica de Madrid (UPM), in collaboration with the Nobel Laureate Carlos Rubbia from the Institute for Advanced Sustainability Studies (IASS, Potsdam, Germany) and the King Abdulaziz University of Arabia Saudi, have developed a technology based on the use of carbon dioxide to improve the energy production in solar fields. The usage of this fluid on solar energy has been verified by the research group of UPM at the Almeria Solar Platform (PSA), achieving excellent results: fluid and inexpensive solar fields that are friendly to the environment. Agriculture has always been a benchmark for production systems in which huge areas are required to obtain economic benefits and trying to reduce harvesting costs. This principle can be applied to the use of solar energy on solar fields for renewable energy production where there are two major competitors: photovoltaic energy and thermal energy. The first competitor cannot currently store large amounts of the energy produced with optimal performance. However, thermal energy allows us to storage energy improving the management of renewable energy, similar to a dam that stores water for a hydroelectric plant. 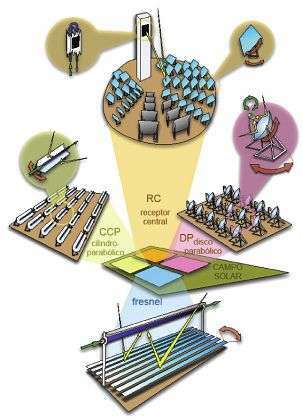 In the case of solar thermal energy, there are four commercialized technologies with varying costs and energy conversion efficiencies: parabolic trough, power tower, solar dish and linear Fresnel system. The first two types have been developing since the 80s but the other two technologies have been less developed. In fact, the analogous to the three-bladed wind turbines has not been found yet. Researchers have carried out a study that adopts an innovative prospect for making design decisions: thermal coherence that prevents excessive temperatures or unnecessary material usage. Observing other fields of energy engineering such as nuclear powers plant is required, since numerous plants work with moderate temperatures (300ºC). Therefore, the solar industry trend of reaching higher temperatures can be unsuitable. Besides, the high production cost can slow down the technological development of the assumed design philosophies. Thus, the disruptive innovation proposed in this study has more potential. The development of these ideas leads to an improved concept of Fresnel by using carbon dioxide as a fluid working that can be used in severe thermal applications such as the cooling of high-temperature nuclear reactors. In addition, the usage CO2 in solar energy can work to confine this fluid and, at the same time, prevent emissions by replacing other thermoelectric plants that use fossil fuels. The technology, developed by UPM researchers, is currently being exploited through the Futuro Solar project by signing an agreement between UPM and OHL Industrial. The Futuro Solar project was submitted in the 2nd call for Research and Development Projects co-financed by the European Economic Area Financial Mechanism (EEA-Grants). This technology is an advanced prototype of the learning curve regarding the current state of thermosolar technology. It is expected to start operating in spring 2016. What is a fluid working? In the case of CO2, do they really mean a fluid? Is the idea that CO2 can function as a solar lens at high temperature? I can't tell. Did google translate this from Spanish? Under high pressures CO2 can exist as a fluid. Not sure why they would choose this medium as a temperature capacitor. a 'fluid' is something that flows. It includes gases as well as liquids.